The nice people at Herstmere’s communications department are doing a great job today keeping electors up-to-date with the count in the local elections and the referendum on voting reform that took place yesterday. 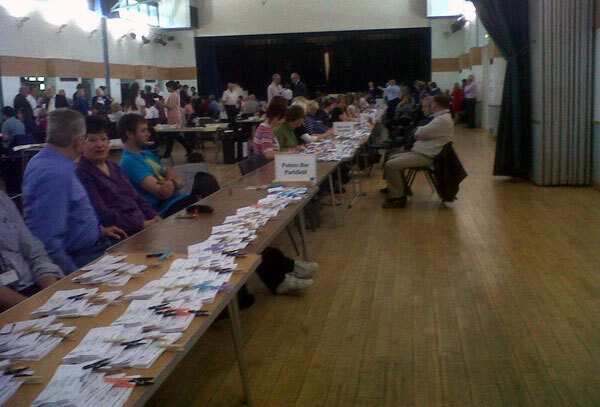 They’re using Twitter to post regular updates and pictures (like the one above, from the count itself). Yesterday they alerted us to the fascinating fact that not everyone who gets a postal vote uses it! Chris Hewett in the Watford Observer picks up the Liberal wipe-out at 1.15. For me, as an elector, this poll has been transformed by social media. Where I might have been able to get results in real-time in the past, I had never bothered to. With details of the poll, the count and the result coming to me via Twitter, though, I’m significantly better-engaged. And the local authority’s willingness to use its own social media accounts to spread the word is a genuine public service. Well done Hertsmere.